Keeping the pipes in order. 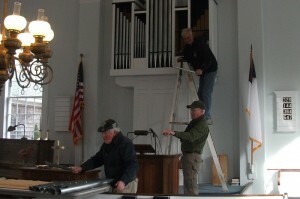 On a cold February afternoon, Bob Conway, Bob Hungerford and Clark Goff met to try to correct the rattle in the organ pipes when certain tones were played. Bob Hungerford has worked on pipes before. They succeeded in tightening some of the fastening by which the pipes attach to the pins in the case and that seems to have done the trick. 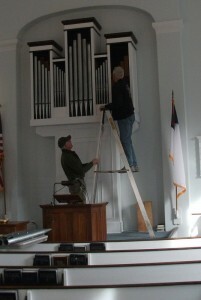 This entry was posted in Organ, PHOTOGRAPHS of Recent Events on February 7, 2013 by admin. What a great service for the church. This Sunday, I didn’t hear any buzzing sound.